…make a jug of Pimm’s and a Chorizo and New Potato salad. Wow, what a scorcher it was last week! Temperatures hit the 30s, official health warnings were issued due to the heatwave and the UK was declared hotter than the Mediterranean. It was fabulous at the weekends and even the brief shower we had on my birthday barbecue didn’t spoil things: we just made a dash for the house carrying plates of food and cutlery while a few of the boys picked up the garden parasol and brought it over the barbecue to shelter under while they finished cooking the sausages. Us Brits have become experts at dealing with rainy barbecues; you have to in this climate. But despite the shower still the heat didn’t let up. The trains to and from work were roasting and even with the windows open it was hard to sleep at night; my poor dog was panting and drinking lots of water. And I enjoyed this Chorizo and New Potato Salad I cooked up for lunch one day, it was perfect for the Mediterranean heat. Cut the potatoes into equal sizes, or keep whole if very small, and boil them until tender. Once they’re cooked drain them and set them aside. Fry the chorizo over a medium heat until it releases its oil then turn up the heat a little and add the peppers, tomatoes and potatoes. Fry the mixture, turning it as it cooks, until the potatoes turn golden and the chorizo is cooked through. 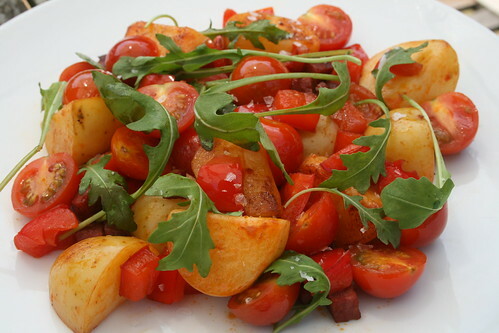 Put the new potato and chorizo mixture onto plates then top with the rocket and sprinkle over some sea salt. But as the good old British summertime goes, we’re now back to rain. And with the wind blowing up outside today you could be forgiven for thinking it was a sunny Autumn day. Anyone for hot chocolate? Here it is quite hot too! That slad looks mighty scrumptious! Happy belated Birthday, Julia! I hope it was a great one. And rainy barbecues? I wouldn't know how to deal with that. If it happened to me, you would see a George Foreman grill appear within a matter of seconds. Question: You have mentioned an ingredient called "rocket." Would you know what that is called here in the US? Because I have no clue what that is. ps…wish it would rain here. I am over in the USA, and click on your blog from time to time to see what you have been making. I love the videos because I get to hear your lovely voice while you explain things. Now, I don't believe we have Pimm's in the USA, so what would be a substitute for it? I am assuming it is a wine of some sort. Julia, what a beautiful looking salad. I bet it taste fantastic. Great photo as well. Super job my friend. I remember having bbqs under a tarpaulin when I was a kid! I've got some chorizo and potatoes lying around, and this recipe looks just perfect for dinner. Thanks for posting! What is this Pimm's stuff, exactly? I've never heard of it here in America. Hi Kamran, hopefully S. Stockwell has answered your question. It's a peppery tasting salad leaf. 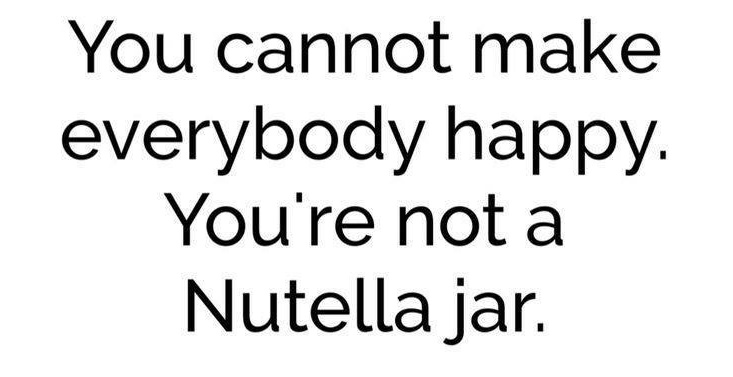 You could substitute it for something else. ps I've been reading your site for a while and haven't commented before – it's gorgous! Great recipe and a great introduction to Pimms. If you're into doing something a bit different, I really recommend trying it with either traditional cloudy lemonade, ginger beer or even tonic water. Mmm – really like the idea for this salad. Chorizo is something which I've only recently started to enjoy so am keen to use it more often! Actually, roquette or "rocket" seems to be catching on as a term over here in the states. Grocery chain Trader Joes now bags arugula with all three names on it. And with all due respect to my favorite blogger Julia, you should come visit us in Arizona if you want to see what real heat feels like. It'll be 109 degrees over the weekend. And it only gets down to 80 at night. Whew! A whopper of monsoon storm just moved through with massive lighting, thunder and rain. Delicious, also works very well with good Spanish morcilla. But pssssst… It is kind of stretching the definition of a salad a bit isn't it? Hi Daniela – I'm really pleased you liked it. I don't think it's stretching the definition of a salad – it's a potato salad! Look in your local liquor store for Pimms. We have it here in North Virginia. Takes me back to lovely summer English BBQs! Caleb – I don't do link exchanges as such but do have a list on my sidebar of all the blogs that link to me so I'm happy to add you there if you'd like to link to 'A Slice of Cherry Pie'. Thanks a lot! I'm also a gourmet and pastry enthusiast and this would really go to my compilation. I would also like to share. I came across a good site about European and Swiss cooking which also gives free sample family-secret recipes.